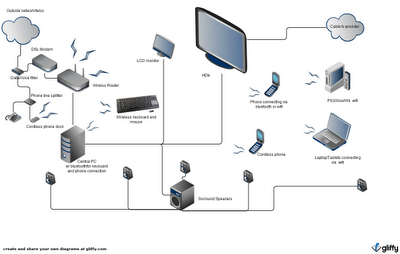 I'd like to share how I envision our home network would be and how close we are to completing. Basically, my goal here to remove as much wires as possible to be able to make the devices portable and easy to set up (wireless). I want that the devices can be able to connect anywhere in the house. Of course there are connections where in you can't remove the physical wires,for now (such as hdmi pc-hdtv, dvi pc-monitor, outside phone line to filter, dsl modem cat5 cable to wireless router etc). As you can see from the list and the diagram. I'm almost complete with my design. The only thing that is missing is the laptop/tablet and gaming system (you can also from the list why we don't have one yet). I'm looking into some possible ways (wireless speaker adapter kit, wireless display from intel etc) in order to connect the surround sound speakers wirelessly, as well as the monitor and HDTV. I've found a device that can be used but they're too expensive right now and are using the 2.4ghz band (same frequency our cordless phone, keyboard, and microwave are using). Also , there are issues when it comes to syncing of voice and visual information(speakers and display) when data is transferred wirelessly. until this things are ironed out already, i guess we'd be sticking to wired connection for the speakers and displays for now. To fully enjoy your home network you might want to look up DLNA and the Tomato Firmware for wireless routers. If you have answers regarding my setup feel free to ask. so you almost have a fully wired set up, i want to get away with cables.. Anyway, im sorta interested on the tomato firmware, is it better than dd-wrt? My router is netgear WGRT-624. Im not sure if it can be flashed with custom firwmwares and im not comfortable too on doing it. Im afraid i might brick my device. but im really looking into upgrading the firmware the firmware to improve performance. I just dont know when and how. the problem is that my router is out of warranty, so if I accidentally brick this damn device with led and antenna, i'll have to replace it with new one.